Just because I'm tired of seeing Anime talk in the Say Anything thread. I thought I'd make this one up. Fire away, boys and girls. Umm... not trying to nitpick, since I do agree with you, but shouldn't this be in the Entertainment board? Oh, and My-HiME is kinda like Zidane's fav anime, but the school girls start wailing on each other with mystical weapons and huge monsters. Actually, it partially parodies several genres throughout the series. I wonder if a mod could move it? Sorry. I forgot about that area. Yeah, but since I never saw one episode I doubt it'll not even be close to Melancholy or it's superb plot. And I'm gonna go out on a whim here and guess that Frosty made this thread to preserve his sanity, or lack thereof. Actually Zidane, you would enjoy My-hime, if it's anything like the manga. There's a reason it has a warning sitcker and is wrapped in plastic, if you catch my drift. Actually, the Manga is more centered around other characters, from what I heard. Namely, Tate Yuuichi. The anime is much more centered around Mai. And it has fun songs with made up words (turns out Mezame by Kajiura Yuki doesn't really have real words). Please refrain from discussing illegal activity. -MasterChief. Other than that, I have been watching the anime and reading the manga for Claymore. ?At first I didn't find it too appealing with the character designs, but I gave it a chance and got sucked in to it's engrossing back story later on. ?The action is good and there really isn't any filler yet, so I'm keeping my eye on this one. I hope it's okay for me to talk about Melancholy here. And Lucky*Star, too. Of course it is. What isn't okay is thread bumping/necromancy, trolling, or disrespectful posts. Make sure your comments are substantive, relevant, and respectful, and we'll all get along nicely. 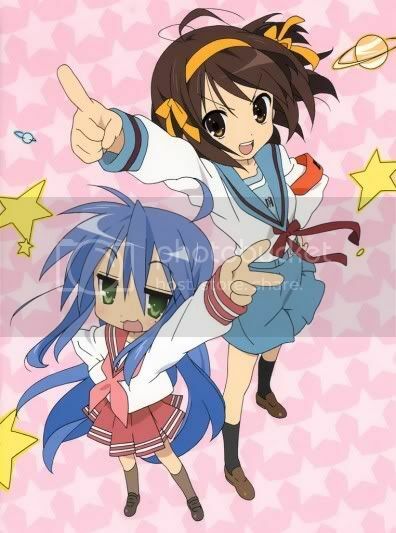 I must say I am absolutely hooked on Lucky*Star. A great anime that plugs another anime (i.e. Melancholy) of the same greatness is A-OK in my book. Yet, there still hasn't been a release date yet for an English dub version of the series on BEST BUY's website. Can any of you guys notify me about that if it ever comes up? Please? Well, considering that the Lucky Star series hasn't finished airing yet in Japan, I'd say it'd be at least a year that it comes here to the states. They started Melancholy in April of last year and that came over this May, and Lucky Star started April of this year, so I'd expect the same (although maybe later, since it has more episodes). Huh. I didn't know they both aired the same month in Japan. Guess that's why both animes seem so connected. BTW, I read in a comment box that the Japanese VA for Haruhi also voices Konata. The coincidences keep pilin' up! To celebrate: a double dose of my two most favorite animes! Not that it does any good. (Paws @ Aug. 08 2007,14:21)</div><div class="QUOTEHEAD">QUOTE</div><div class="QUOTE">I fixed his post. There we go. I figured someone'd be able to decipher it. On topic, I am several weeks behind in Bleach and it's making me sad in the pants. I should go watch it. Well, I won't lie Zidane. That pic is quite adorable. Like tripping on a victory lap. Uh-oh Zidane, there's a Lucky Star DS game, and another one that either out or is coming out. Better get on that. Don't bother, they're on filler right now and most of it is terrible. Plus, I think they went with a new animation studio. I don't know how long this filler will be, but Ichigo just finished a fight with Grimmjow that has lasted a couple of months in the manga. The episode with Ikkaku and Keigo's sister in the kendo tournament was amusing though. My wife watches Bleach, and she likes it. But there's just so much that I'm a bit intimidated to begin it. I barely have time for regular shows, let alone ones with hundreds of episodes in backlog. Also, I wish there would be a new Gundam series. I could use more giant robot fun. Actually, with how the arcs work out, they are kind of like one continuous episode broken up to fit into a Wednesday slot. Even the first filler turned out that way (you know, the filler that was actually... good). That's the unfortunate thing about Bleach. It requires a bit of filler in order for Tite Kubo to get ahead in the manga. He likes a lot of long, drawn out fights. Speaking of hundreds of episodes in backlog. Bleach only has 136 episodes so far. New Gundam? Who loves ya, Baby? I still watch Bleach, though I have no idea why. I haven't really enjoyed it literally since episode twenty-something. I guess it's something to do. I can't WAIT to start watching that. After reading up on it a bit, I'm a bit disappointed that it's not in the SEED universe. I've been greatly enjoying that. The alternate universes have been a bit hit or miss, but I've not been disappointed with anything released after Turn-A. And that wasn't bad, I just never had the time or interest to finish it. The director has worked on a lot of good stuff including Evangelion and FMA, so I have high hopes for his talent. As for the main artist, I don't know much about her. I've never seen anything she's worked on. Anyone know anything about her? But Turn A was aaaaaaawwwwwwwwwwwwwwwwwwwwwesome! Hmm. Looking into it, I've heard of nothing she's done. But I love the mecha designs.